Kishaun really loves to move. Once seated on an adaptive tricyle, 10-year-old Kishuan zooms up and down the corridors of St. Mary’s Home so quickly that his therapists sometimes have trouble keeping up with him. Like most of the children who live at the Home, Kishaun uses a wheelchair. He also can walk, with assistance, for short distances. Pedaling on the tricycle helps him walk by warming up his legs and strengthening his muscles — all while he’s having a blast. 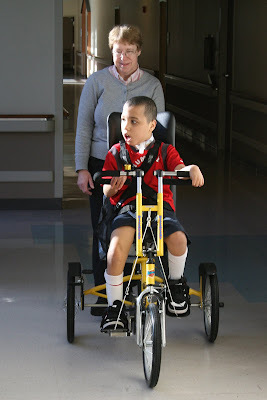 Kishaun is one of about 15 children at St. Mary’s who now regularly ride a tricycle as part of their physical therapy. The seats and handlebars are easy to configure to give each child a comfortable ride. While the child grips the bars and pedals, a therapist uses controls on the back to steer. Through the generosity of supporters, the Auxiliary Board of St. Mary’s Home was able to donate funds for the Home to buy two of these tricycles.